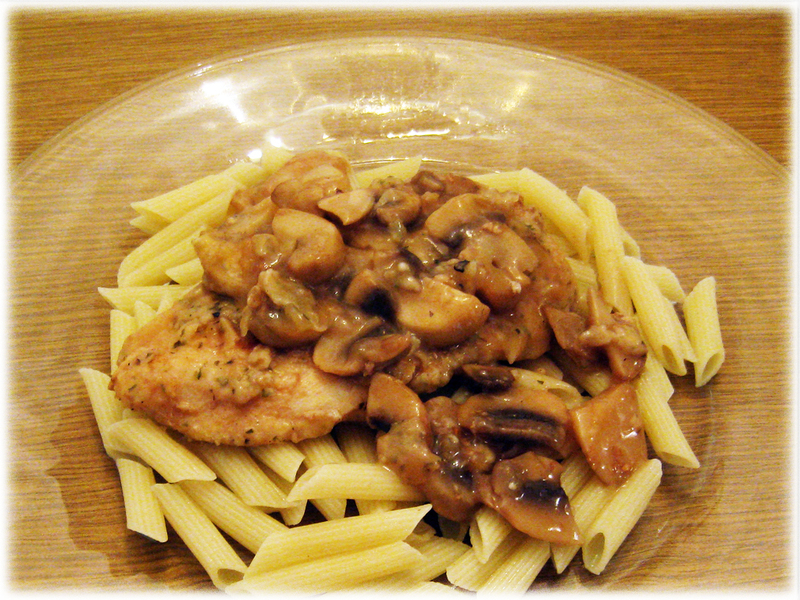 I wasn’t always the biggest chicken Marsala fan after tasting the mass produced, overcooked, dry version at my college cafeteria. It is super easy to make though and can hit the spot when you want a little Italian in your life (insert “that’s what she said” joke here). I can’t take full credit for this recipe either since there is a similar recipe on every bottle of Marsala cooking wine. Nonetheless, I can take credit for cutting a lot of calories and adding a few twists, like how to thicken the sauce. I also guarantee that this is much better than the chicken Marsala from a college cafeteria. 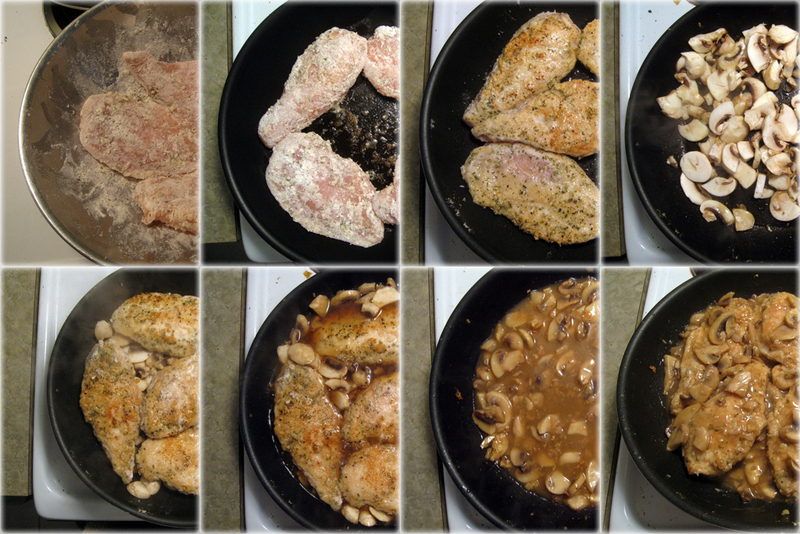 Makes five servings of about 208 calories per piece of chicken (1038 cal. total). (It may actually be very slightly less, since you probably don’t use all of the flour). Note: You don’t need to cook with flour for this recipe, but that is more traditional. Cut out the flour and save 100 calories. Note: If you’re not an oregano fan, use dried basil instead. Note: If you don’t have a non-stick pan, you may need to use two teaspoons. Combine the flour, salt, pepper, oregano, and parsley into a mixing bowl. Lightly coat each piece of chicken by rolling or tossing it in the flour. Note: Don’t go overboard coating the chicken or you’ll need more flour. Melt the butter in the pan on med-high heat, add the chicken to the pan, and brown both sides for a couple of minutes each (you’re not trying to cook the chicken all the way here, just get some color on it). Remove the chicken once browned and set aside on a plate. Add a teaspoon of olive oil to the pan and toss in your washed, sliced, mushrooms to cook a bit as you stir them with a wooden spoon in the oil. Once the mushrooms have cooked a bit (maybe 2-4 minutes), place the chicken back on top of the mushrooms. Add the Marsala wine, cover the ingredients (you can just use any large pot lid, if your pan doesn’t already have one), lower the temp to med-low, and let simmer for 10 minutes or until the chicken fluids run clear. Note: Some brands of Marsala cooking wine at the supermarket come with salt added, so be careful not to over-salt! While the chicken simmers, mix one teaspoon of corn starch with a half cup of room temp or cold water. Note: If you add the corn starch to hot liquid, it will solidify and make chunks, so always use cold, room temp, or mildly warm liquid. After 10 minutes, remove the chicken from the pan again and place aside on a plate. Add the well-mixed corn starch and water to the pan of wine and mushrooms. This will thicken the sauce so that it coats the chicken well. Add the chicken back to the pan and toss/mix with the sauce until the chicken is well coated. Serve over pasta (210 cal. per 2oz. ), rice (150 cal. per 1/4 cup uncooked), potatoes (calories vary), or just eat as is (208 cal. per piece of chicken). I served it over penne pasta. Total calories for the meal = 418.